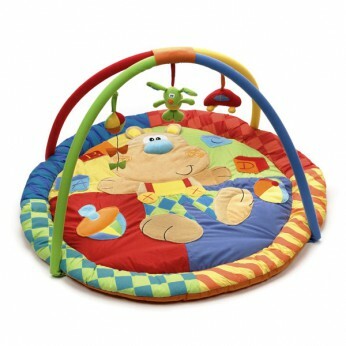 The Playgro Toy Box Juggling Bear Gym features lots of fun colours and patterns to stimulate baby’s visual interest. Lie baby on it’s back and the dangling detachable activity toys will entertain baby with their bright colours and activities. Fun colours and interesting patterns that will pique baby’s interest. Combining cute detachable characters and vibrant splashes of colour, this gym evokes an air of playful charm. This toy costs approximately £19.99 (for the latest and best prices make sure you check our retailer list for the Playgro Juggling Bear Gym above). In our review of Playgro Juggling Bear Gym we classed it as being suitable for ages 0 to 11 months but recommend you check the manufacturer specific advice before purchasing.